Christmas dinner is perhaps the most important meal of the year in most houses. Christmas is a time for family and togetherness and each year grown-up children return from the four corners of the world to be with their families for Christmas. There are few occasions during the year when families are so fully reunited, hence the importance of Christmas dinner when most of the chairs at the table will be filled by their rightful occupants. 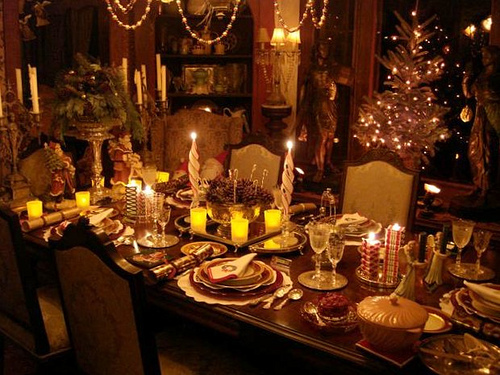 Setting the perfect Christmas dinner table is different to setting a table at any other time of year, however formal the dinner, as the occasion calls for seasonal touches and decorations to make the meal festive and special. Before you even begin to set the table, you should think about what colour scheme you want for your Christmas dinner table as this will help you choose the right table cloth, crockery, cutlery and decorations. Most people know that red and green are Christmassy colours, but if you want to do something a little different, you could go for purple and green, red and gold or even black and gold. So what will you need on the table? From a practical point of view, everyone will need a charger plate, a water glass, a wine glass, a champagne flute, cutlery, a napkin and a soup bowl (if you’re serving soup!) You’ll also need crockery for the table, serving utensils and placemats for hot dishes. As for how to arrange your table, each person’s soup bowl should be on their charger plate, which should be directly in front of them. The knife and fork for the main course should be placed on either side of the charger plate and the knife and fork for the starter should then be placed on the outside. The dessert fork and spoon should be placed at the top. Once you've set a place for everyone, you should begin to decorate the table. A centrepiece is a must as it acts as the focal point of the table. Holly is festive and easily acquired, so you could put some in a vase and use it as a centrepiece. Alternatively, you could use candles or a Christmas ornament as your centrepiece. Christmas crackers are a nice final touch and always go down a treat with children and adults alike. If you like taking photographs, why not take pictures of your Christmas table before, during and after? It could make for a nice triptych in a Christmas album or even in a frame. Plus, you’ll be able to show off your beautiful Christmas table setting long after it’s been ruined by ravenous husbands, sons, daughters and whoever else you invite to Christmas dinner! This article was written by blogger and homemaker Sylvia Brown who used to work with a dining table manufacturer and has always liked knowing dining table etiquette.